A beautiful mountain trail of Sahyadri runs between Bhor - Mahabaleshwar and conceals 3 to 4 forts within it. One of these forts is the Fort of Rohida, also known as Vichitragad or Binicha Killa. It is situated in the valley of Rohid in the Basin of Neera River about 6 miles south of Bhor. Rohida Fort was the main centre for the villages of Rohid valley. 41 villages, out of original 42, within this Basin now come under Bhor Taluka of Pune. The flourishment of sugar and milk industry in this area has led to the prosperity of villages and are well equipped with electricity supply and have a good road connectivity. This historic fort is known to be from the period of Yadavas. Carvings on the 3rd entrance gate of the fort suggest that the fort was modified by Mohammad Adil-Shah. It also depicts the conquest of this fort in May 1656. Shivaji Maharaj won the fort from the hands of Bandal-Deshmukh of Rohid in a close battle. The conflict resulted in the death of Krishnaji Bandal. After the battle, many officials along with Bajiprabhu Deshpande, a chief administrator of Bandals, were inducted into Swarajya movement. As per the infamous �Treaty of Purandar�, in 1666, the fort was surrendered to Mughals. Although, on 24th June 1670, Shivaji Maharaj regained the control over this fort. 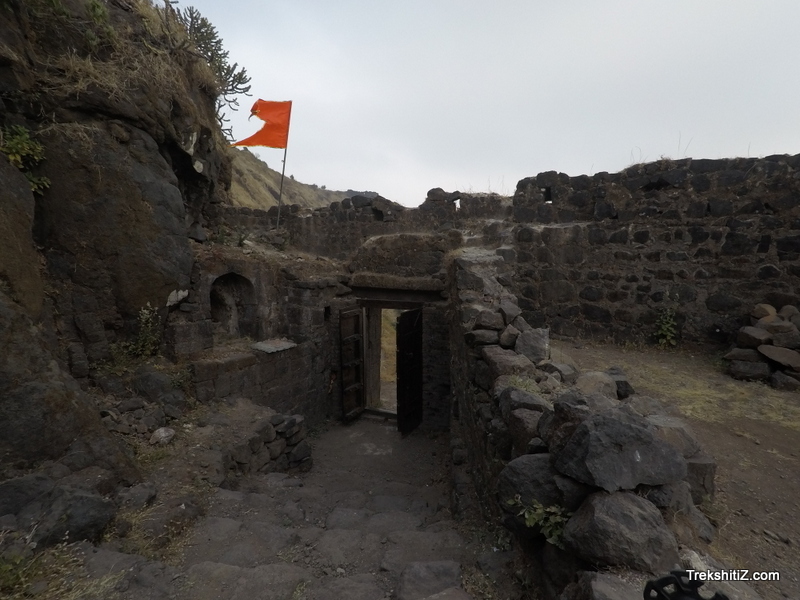 Kanhoji Angre had the patronage over the whole Bhor area and half of Rohida Fort along with patches of land. The fort holders (Gadkari) of Rohida used to take 30 gold coins (Currency of Hon) as payment. According to the historical records, officials weren�t satisfied with this amount. They questioned against it but Shivaji Maharaj ordered only to persist with the traditional payment because Jedhe were an acolyte to Bhosale family. Later, Mughals took over the fort but the chief commissioner of Bhor fought with Aurangzeb and won the fort back. Until the post-independence merger of all provinces, Rohida fort remained with the Bhor province (Bhorkar) along with other forts such as Rajgad, Torna, Tung and Tikona. A series of Ganesh idols can be seen on the frame of the first entrance gate which also has an arch on top. Second gate is just 15 to 20 steps ahead. An underground water cistern is right in front of the second gate and holds water throughout the year. Next, a 57 steps climb takes to the third entrance gate of the fort. This gate is strongly built and has some artistic carvings on it. Elephant heads are carved on the both sides of the gate. Carvings in Marathi on the left and those in Parsee (Persian) on the right can also be observed. The fortification around here is not in a good condition though. Entering through the gate, one can see the remnants of two building structures. One of which might be a courtyard while other presumably be the residence of the Fort Commander (Killedar). Walking along the left side leads to a temple of �Lord Rohidmalla� or �Bhairoba� in common language. Idols of �Lord Ganesh�, �Bhairoba� and �Bhairavi� can be seen inside. A small water tank, a lamp stand (Deep-mala) and some square tombs are resting in front of the temple. Shiravale Bastion to the South-East, Patane and Damgude Bastions to the South, Waghjai Bastion to the North, Fatteh Bastion in East and the Bastion of the courtyard are the total of 6 strongly built bastions covering the fortification wall and are standing undilapidated till date. There is a series of cisterns on the Northern part of this fort. An underground water tank, a human statue and the typified Relic of Lord Shiva (Shivaling) can be seen here. About one and half hour is sufficient to get a complete look around this fort. Bajarwadi village is around 8 to 10 kms to the South of Bhor. State Transport (S.T.) buses are available from Bhor to Bajarwadi. A beaten path (kaccha Road) heads to the first entrance gate of the fort in an hour. This route is very simple. State transport (S.T.) bus service is available from Bhor to Ambawade. Another bus route from Pune-Bhor-Panval-Ambawade is also an option. Route to the fort goes from East of Ambawade village over a ridge. Though, it is commonly advised to avoid this route because it is very long and slippery. It takes about 2 and half hours to get to the top. A simple route from Bajarwadi should be considered for climbing and the route to Nazare or Ambawade for the descent. This way, it is easy to head towards Raireshwar. 1. Acquire a State Transport (S.T.) bus from Bhor to reach Karli village. From Karli, it takes about 2 hours to get to Raireshwar via Lohadara. Another 1 and a half hour is required to reach the settlement on the Raireshwar Plateau. 2. Take a State Transport (S.T.) bus, Bhor-Titeghar via Vadtumbi, from Ambawale (02:45 pm). Get off the bus at Vadtumbi pass. A 15 minutes walk from here leads to Vadtumbi village. It takes approximately 2 hours from here to reach Raireshwar plateau. 3. Reach Korle village by acquiring a State Transport (S.T.) bus. One can take a stay in the village if required. A 3 hour walk via Gaidara leads to the temple on the Raireshwar plateau. 4. Get to Dabekeghar village by taking a State Transport (S.T.) bus. Reach Dhanavli village from Dabekeghar on foot. It takes 3 hours via Waghdara to reach Raireshwar from Dhanavli. 5 to 7 people can stay in the �Rohidmalla� temple barring the monsoon season. Potable water is available throughout the year. Around 1 hr from Bajarwadi village to reach top.